The art of pottery has ancient origins and even today it impresses everyone, even the most inexperienced, curious to know the ancient craft secrets. 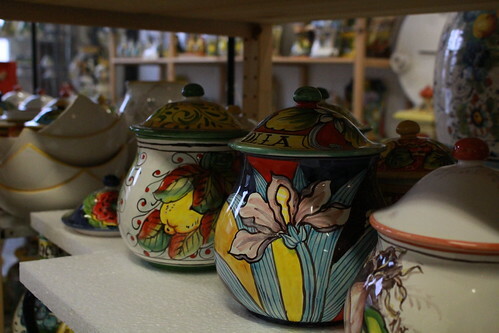 Near the Florentine countryside, the town of Montelupo has a long history in the production of artistic ceramics. Some beautiful artifacts were commissioned for the Florentine pharmacies of the Dominicans of the Church of San Marco and Santa Maria Novella, known throughout the world for secular recipes and preparations of products of health and wellness of the body. Many of the Montelupo ceramics can be seen even today in different parts of the world thanks to their diffusion by donations and purchases that date back since the times of the Medici family. The memory of this long tradition of ceramic art has survived to the present day thanks to the old families of artisans that have passed down from one generation to the other the craft skills and technical knowledge. Its secret, however, do not remain closed within the walls of these art workshops. Discover the art of pottery with Travelability. The tour includes a visit to the Ceramics Museum, followed by a visit to a historical company of the territory where it will be possible to follow a pottery decoration workshop and take home your work of art! All this can be accompanied by a break in a typical restaurant of the place.